Note: Some of the processes described in this article are determined by the version, or phase, of Zendesk Chat you’re currently using. Make sure you’re following the correct instruction for your version of Chat. To determine which version you’re using, see Determining your Zendesk Chat account version. You can modify your personal settings in Zendesk Chat from the dashboard. These settings affect your only profile, not other agents'. For information on updating your notifications, including editing your offline chat notifications, see see Changing your email notification preferences. Name: Your real first name. Email: The email address you use to log into the dashboard. Profile (Chat Phase 4 users only): Click to update some profile elements (see below). Display Name: The name that shows up on the widget when you're chatting with visitors. Tagline: Appears below your display name on the widget. Avatar: The photo that appears when you're chatting with visitors. We recommend using a photo with with dimensions of 50 x 50 pixels. The maximum size is 100KB. The steps for updating your profile information differ based on which version of Zendesk Chat you’re using. For help determining which version you have, see Determining your Zendesk Chat account version. Then click the link below to view your instructions. Zendesk Chat Phase 4 users update their personal profile information on the Edit Profile page, or in Admin Center which is accessed from their Chat dashboard. On your Chat dashboard, select Settings > Personal > Profile tab. To modify your name, email, or password, click the Edit Profile button to open the profile page in Admin Center. Edit these settings as needed. Click Save, then close the Admin Center tab. Edit your display name, tagline, and avatar if needed. To edit your password, see Changing your password, below. Modify your display name, tagline, or avatar as needed. For information on updating your remaining profile information on Zendesk Support, see Viewing your user profile in Zendesk Support. From the dashboard, select Settings > Personal > Profile tab. 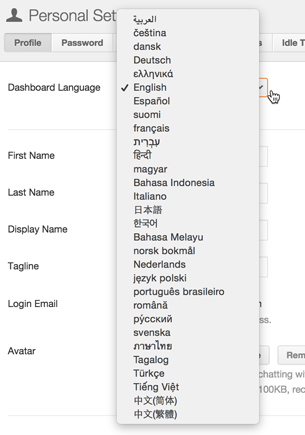 In the Dashboard Language field, select a language from the drop-down menu. Your administrator might have set a maximum number of chats that you can take concurrently. Depending on how your administrator set up chat limits, you might also be able to edit your own limit here. Go to Settings > Personal > Profile tab. Chat Limit is not enabledmeans there are no chat limits set for your account. Chat Limits are set for the whole account means the limit in the field applies to you and all other agents in your account. You cannot edit the limit. Chat Limits are currently set by admins means the limit applies to you specifically, but only an admin can edit the limit. If no banner appears and the field is editable, you can enter a new chat limit for yourself. The steps for updating your password differ based on which version of Zendesk Chat you’re using. For help determining which version you have, see Determining your Zendesk Chat account version. Then click the link below to view your instructions. Select Settings > Personal > Password tab. In the Profile section, click the Edit Profile button. On the profile settings page, click the Change password button. Enter your new password twice, first in the New password field and then in the Confirm new password field. Your password is changed in Zendesk Support. See Changing your password for information. Hi! I don't have speakers on my computer. The visual notification that pops up disappears quite quickly and so when I'm not at my desk and come back I can miss some chat requests. I would prefer for the pop up visual notification be active until the chat request has been addressed. It would be PERFECT then :) Thanks! The default timeout for desktop notifications is 5 sec, too short for my liking, you can change it from the Personal > Labs tab on the Dashboard. Can an admin change the notification sounds for all chat users instead of having them do each user individually? I actually don't want agents using the settings dashboard or adjusting their chat settings at all and would prefer to be able to make changes globally. Is this possible? The only way I've found I can do this is assuming the user's identity through the old Zendesk and manually changing the settings for each user. Currently it is not possible for admins to change sounds notification for other agents or lock down settings for the agents. These changes are not in our 6-9 months roadmap, however we are working on roles and permissions feature that will allow admins to lock down other settings such as shortcuts for the agents. This update won't include ability to lock down sounds notification though. Roles and permissions will be available to customers on Premium plan and we will make an announcement when the feature is ready. Hi, I don't see the default timeout for desktop notifications in my labs - is there a reason why?